Trying to shift those ski boots, bomber jacket or cat box on eBay? Here’s a tip – be hilarious. An eBay advert for an old wetsuit has gone viral after the seller wrote a virtuoso piece describing how he had never urinated in it, how he loves the feel of “fresh neoprene” on his “soft skin” and how it was better than his friend’s second hand wetsuit which looked like an “old man’s testicle”. 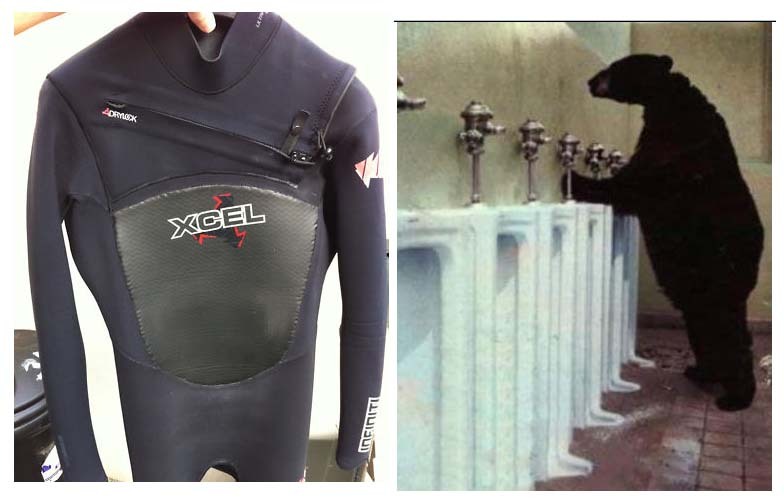 It’s by a Cornish guy called Dan Morgan, there’s a picture of the wetsuit – “used XCEL 3-2mm Infiniti Drylock Summer Wetsuit” and also a picture of a bear standing next to some urinals. The piece has attracted some opprobrium from eBay who – it seems – object to the picture of the bear at the urinals because it doesn’t accurately describe the product. Sometimes being cute and weird back-fires on you. Sometimes it pays off! This is one of those cases. It’s a bit like the wonderful Three Wolf Moon meme which started on eBay after some jokesters started posting glowing reviews on postings of the t-shirt.